We are developing evidence-based models of the different roles teachers play in university classrooms for residential students. 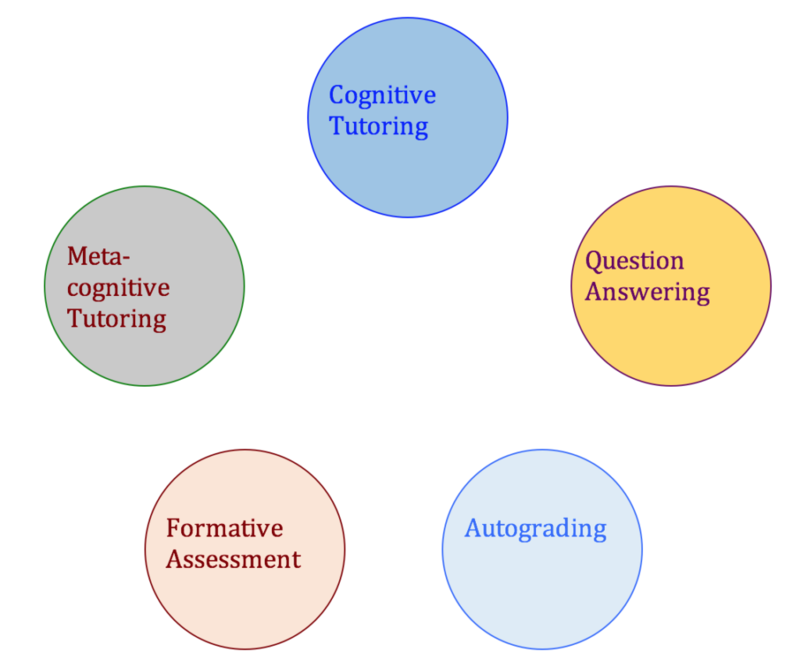 Further, we are developing multi-functional virtual tutors with the capacity to replicate many of these roles. This means that a virtual tutor in the classroom may start with assisting in the way a student engages with the content on first learning, move to providing formative assessment along the way, and finally aid in the process of evaluating progress. We expect that when completed the virtual tutors in the classroom will be able to perform many typical functions of human tutors as indicated in the figure below. These functions will include answering questions, cognitive tutoring on the course materials, meta-cognitive tutoring on the class projects, evaluating student progress including grading assignments and examinations, and providing meaningful feedback on the assessments. Some capabilities of the virtual tutor, for example, answering questions and feedback on assessments, will be personalized to individual students: the Virtual Tutor will use data about each student’s performance to build student models and adapt its interactions accordingly.